Herbal tea gardens create a romantic interlude for that evening stroll or quiet moments under the stars as they scent the air with their delicate fragrance – but they have more practical uses as well. Leaves or flowers steeped in boiling water and served chilled in frosted glasses make the perfect ending to a long, hot day. Growing your own herbal tea garden is easier than you think and provides the makings for both iced and hot teas to soothe the soul. Choose an area that receives at least 6 to 8 hours of direct sunlight a day. Till the soil to a depth of 8 to 10 inches. Add a 2- to 3-inch layer of compost or well-rotted manure to improve aeration and promote drainage. Herbs produce the richest flavor and fragrance in average to poor soil and typically do not require supplemental fertilizer. Mint: The common choice is peppermint, but there are many flavors available at your local nursery – from the rich flavor of chocolate to delicate apple. 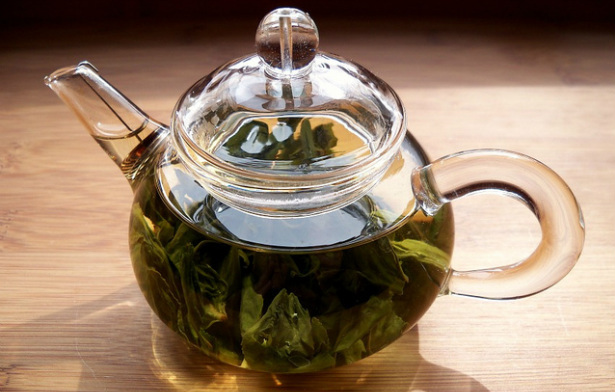 One or two mint flavors will provide the base for a variety of teas. Lemon Balm: Lemon balm emits an uplifting, citrus fragrance when the leaves are bruised, making this an excellent choice for tea gardens. This perennial returns each year with attractive yellow-green foliage and makes a flavorful tea that can be served either hot or cold. German Chamomile: Chamomile flowers make a tasty tea known for its ability to induce relaxation. The University of Maryland Medical Center claims that chamomile is generally safe, but should be avoided by pregnant women, as it may contribute to miscarriage. It may also worsen asthma or interact with sedatives or alcohol. Grow chamomile along borders to show off its daisy-like blooms. Rosemary: This herb resembles a tiny Christmas tree and produces pungent, needle-like leaves ideal for flavoring teas. This perennial returns each year, but may need protection from winter weather in colder climates. Harvest leaves at any time once they are of a usable size, if you desire to make a cup or two of fresh tea. For larger harvests, pick them in the morning once the dew has dried. Cut the plant back to the second set of leaves. This encourages new growth and creates a dense, compact plant. Bundle sections together and hang them upside down in a dry, well-ventilated area to dry. Check them every few days and turn them so that all the leaves are exposed to fresh air. It may take up to two weeks to dry the herbs, depending on the size of the bundles and the air circulation. The leaves should be dry and crisp with no signs of moisture. Remove the leaves from the stems and store them in an airtight container in a dry, dark area. Place 2 to 3 tablespoons of fresh herbs or 1 to 3 teaspoons of dried herbs in a mug or cup. Pour boiling water over the leaves and steep for up to 8 to 10 minutes. Dr. Leonard Perry from the University of New Hampshire Extension Office warns that steeping the leaves for more that 8 to 10 minutes releases tannins in the tea and gives it a bitter flavor. Add honey, sugar or sugar substitute to sweeten, if desired.